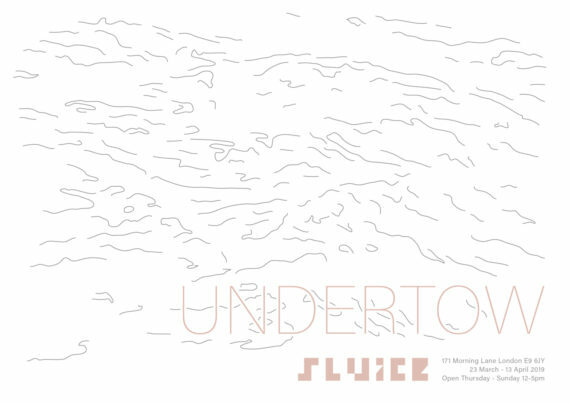 Undertow brings together Alex Simpson, Alison Rees, Lauren Ilsley, Nicholas Middleton, Sarah Wishart, Isobel Church & Tana West in an iterative conversational research show working across film, photography, ceramic art and text-based work. ‘When prevailing discourses tip towards hyperbole, generalisations or simplification, there is a need to swim against the current, to carve out a space that allows for ambiguity, correspondence and a quieter voice. In the employment of few words, a scale of action or use of minimal materials, understatement can be both a way of confronting moments of crisis, or of evading them. Undertow brings together a group of artists working in dialogue around these concerns. The exhibition at Sluice represents a momentary iteration of the research group’s findings, the public-facing part of an ongoing series of interconnected activities. The group as a structure has developed to create a support network for the artists involved, to initiate conversation, to share knowledge, and to provide context. During the exhibition, the gallery space will be used by the artists as both a forum and as a residency, a means to test ideas and outcomes. The Undertow research group’s remit is open, as is the shape it takes, and the work is rooted in the sensibilities of material and material understanding. What emerges in the work coalesces around language, data, codes, a collapsing of scale, of how a still surface half-reveals, half-conceals subterranean undercurrents.